Aroma Thyme's chef/owner Marcus Guilano has teamed up with Tommy Keegan to throw a big beer and cheese party in the Keegan brewery. Last year Tommy had a bunch of local brewers join the party. And they will all be back this year. Chef Marcus is making several dishes that feature local Hudson Valley farmstead cheeses. And what goes great with cheese? How about local beer. If you like Great Cheese & Great Beer then this is your event!!! Tommy is naturally in charge of the beer. Tickets are only $30, which includes the beer and food. RSVP at 845 647 3000 or 845 331 BREW. a handful of medical conditions including 28 years of asthma. For more information visit www.chefonamission.com. www.aromathymebistro.com. 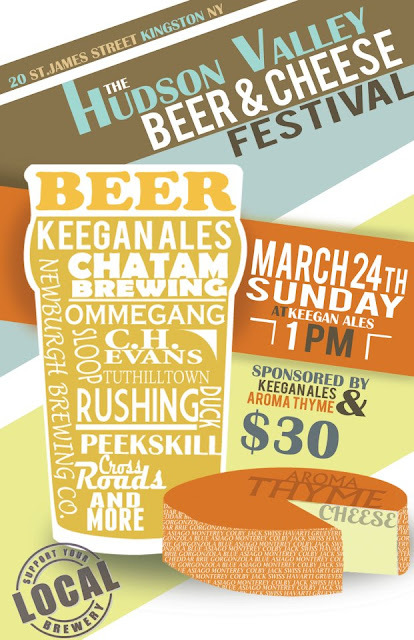 Keegan Ales was founded in 2003 by Brewmaster Tommy Keegan and quickly earned the reputation of “The Hudson Valley’s Brewery” after the first beers brewed won accolades at The Hudson Valley Beer Festival taking home both a gold medal and Best of Show. Keegan Ales has gone on to receive a warm welcome from both the general public and local business community and is now available throughout the tri-state area. In 2010 Keegan Ales was named Ulster County Small Business of the Year. Today, with the addition of a pub and tavern, Keegan Ales is proud to be considered one of the regions “hot spots” for music with live shows almost five nights a week and almost never a cover. Visit www.keeganales.com for more info, event listings, new beers on tap and music calendars.